Yes indeed, the one and only Big Daddy Kane. It took some definite thinking when it came to who I was going to pick for the 8th slot, but honestly all I could think about was Kane. Now, I know his career after 1989's "It's A Big Daddy Thing" was largely rocky/up & down, however, my decision is based largely on his career circa 88-89. That stretch right is SO impressive that it more than justifies my pick. Not only that, the man was as smooth as they come on the mic, effectively balancing that with a true sense of rough, rugged, and raw lyrics, nice punchlines, and very witty wordplay. 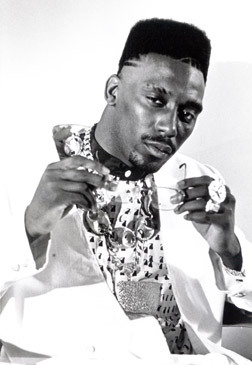 The following are my 10 favorite BDK songs not only from this era, but my favorite BDK songs period. Check it out! And yes, I know the classic "Symphony" track has one of his best verses ever, but this focuses on his solo work, respectively. Classic material right here, plus it has one of the best beats ever, thanks to Marley Marl. This is definitely my #1 favorite Kane song, and it has SO many memorable quotables that I would end quoting literally the entire song. Timeless. Don't get me wrong, the remix included on "It's A Big Daddy Thing" is tight, but I've always liked this version better. It was a perfect song for the classic film "Lean On Me". Truly a song with a message, which is something you DON'T get these days in hip hop, at least on a mainstream level. The title of this song says it all. Another true classic that still holds up today, and through three memorable verses, he shows why he's THE smooth operator, no question. One of the best openers in hip hop history, this title track gets the album off to a great start, and if it didn't have you anticipating the rest of the album, well, I don't know what to tell you, lol! Over another classic Marley Marl track (he was one of the few producers to bring out the best in Kane), he delivers a powerful, lyrical performance. You just HAD to listen to what he said and HOW he said it. "A champ like Tyson, a captain like Kirk, no/Employee of the month, cause yo I do work!" I've always liked this one a lot. Kane's lyrics over a tight Teddy Riley track was a very good thing at that point, especially with the upcoming "New Jack Swing" era taking place. This video also shows that Kane was multi-talented, as not only could he bring it with the best of them on the mic, but the man could move on the dancefloor, and not too many could do it with such style and grace (in addition to maybe Heavy D). Raw indeed, 5:51 of absolute fire. "Competition may find it spectacular/Scheme and fiend to take a bite like Dracula"
That's my favorite line on this song. Love the lyrics and Kane's beat. which is the McFadden & Whitehead classic of the same title. Kane does it justice too. VERY FEW highlights on the "Taste Of Chocolate" album. "unofficial" last album, "Veteranz Day" largely fell on deaf ears. On this joint, you can listen to Kane and immediately tell he wanted to rip this beat, but towards the end, it's like right there on the spot, he instantly changes his mind. Dope verse too.